Because I’m a 24/7 glasses wearer (it’s a fact: I’ve fallen asleep in my glasses on more than one occasion), I am a massive lover of lipstick. As much as I love the creativity that can go into an eye look, I hate having to cover up all that work with my glasses! So, on myself, I’ll usually reach for a bold lipstick for my everyday look. ColourPop Lippie Stix have been at the top of my most reached for list the past 2 months or so. I am obsessed with the pigmentation and shade range. The packaging makes it super simple to apply + they’re only five dollars! Of the shades I own, Brink is my favorite neutral – it’s got just the right tone to be the perfect “my lips but better” shade. The electric brights, Punky and Yasmin, are both perfect for summer and Grind has an edginess that I absolutely love! Bossy is a very wearable classic red and Fancy has an unexpected vintage coral tone (think Joan from Mad Men). Lumière is a little on the grey/brown side for my skin tone, but would work beautifully for deeper or more olive toned girls. 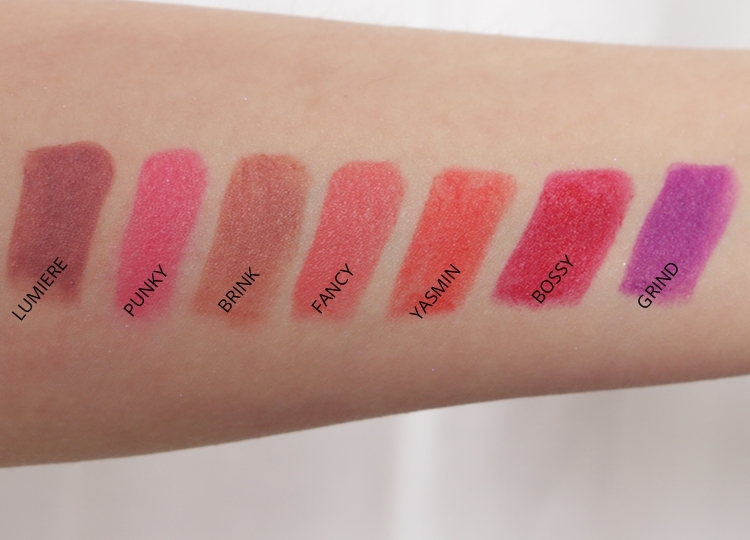 All of the shades are pigmented, semi matte, and fairly long-wearing. I get around 6 hours from the brighter shades when using a lip liner and around 4 hours for the lighter neutrals (Brink and Lumière). The formula is very creamy and has a tendency to go on a little thick if you’re not careful. The smaller bullet is incredibly helpful at controlling placement and I rarely reach for a lip brush when using these. I have no issues with them drying out my lips, which is a huge bonus when working with more matte formulations. Have you tried any of the ColourPop Lipsticks? Which is your favorite?